I didn’t especially expect to chase on this day. It was a lazy day most of the day, and I slept most of the afternoon, waking up finally around 4:30 or 5pm and getting up. I noticed a storm was going south near Ardmore, and decided to grab a quick shower and jump into the truck. 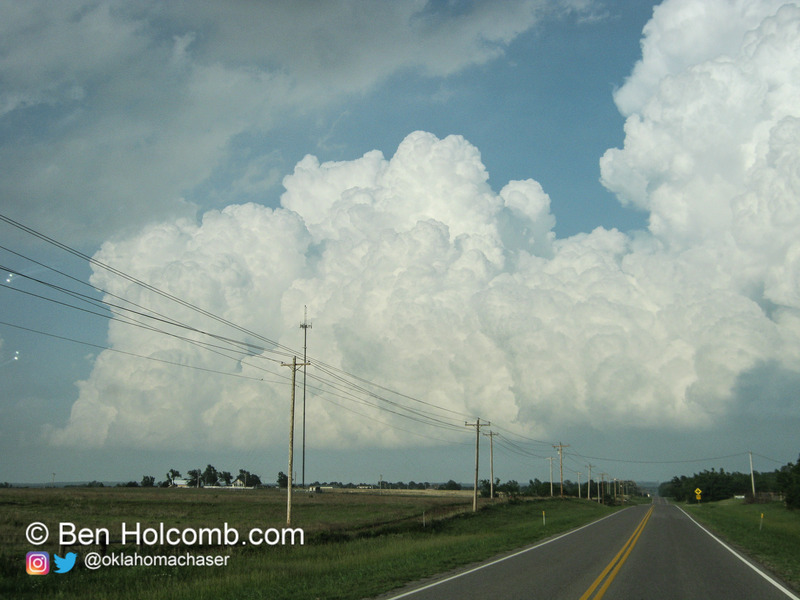 By the time I got outside, storms had started going up over Norman and just slightly south. I had hardly any gas left in my tank, as I had just gotten my truck back from the body shop the previous afternoon. After fumbling with a bit of my equipment I was on the road and south on I-35 towards Purcell. I got off at Purcell and stopped at the gas station to fill up and Rain-X my brand new windshield. The southern storm at this point became Tornado warned, and reports started popping up from tornadoes down south, and the storms to my east were looking very good and starting to show echos on radar. I took SH-39 east towards Asher. Just before getting to Asher I got under the base of the storms I had been watching firing up, but they really didn’t look all that impressive. The storm to its south near Stratford was showing better VIL on radar, so I decided to drop south to that storm. Just as I positioned north of Stratford, the storm became tornado warned. Within a few minutes, it started developing a wall cloud to my southwest, directly west of Stratford with a nice inflow band into it. Eventually I positioned just east of Stratford, and south of Highway 19 and watched the storm wrap up pretty well. Inflow into the storm was becoming a lot more rapid, and the low level mesocyclone had developed a pretty intense rotation. I dropped south to E154 Rd which paralleled SH-19 1 mile south. RFD had begun wrapping around the storm, and I shot east to see a funnel coming down to my due west. A few seconds later a brief multivortex spin up happened just northwest of me in the field. Two vorticies danced with each other in the field for a brief (less than 15 seconds) moment. I continued east and ended up being stuck in trees and hills mostly until finally finding a place to stop just east of County Road 345. I looked back and immediately saw a Stovepipe tornado to my west and north. I dropped a quick spotternetwork icon then got my camera tripodded and ready. Another tornado touched down, this time turning into a dark cone with a debris field at the bottom. I called the NWS to let them know a new more violent tornado had touched down. Somewhere in the excitement of the moment I had stopped my camera and forgot to hit record again. I’m not sure how it happened, but the video is not there. I realized this after the cone had picked up. I hit record right away and captured one last brief tornado before it became too dark to see. I followed the storm to Ada and then north and east to the town of Francis, OK before giving up for the night. I headed back to Ada and met up with Nick Nolte at Applebees for steak dinner to celebrate our tornadoes. All in all, a great chase. Disappointing in the fact that I didn’t hit record, but I still have memories of the tornado that ‘got away’ so to say.